Welcome to Hays Travel Oswestry, I have been in travel 17 years and worked here since the branch opened in 2003. My favourite destinations are Croatia, Mexico and New York. I also love cruising and city breaks. I am very proud to be a manager of such a great team and we have a lot of regular customers who I have got to know over the years. In our team we have Gary, who is Assistant Manager. He has been in travel for 7 years. He loves cruising and his favourite destinations are Barcelona and Paris. He is great at getting you the best rates on your currency! Karen has been in travel 17 years and has also worked here since we opened. She specialises in long haul and family holidays. Her favourite destinations are Barbados and Cyprus. Mel has been in travel 9 years. Mel specialises in group bookings and has booked lots of hen and stag groups. Her favourite destinations are Thailand and Turkey. Claire is a sales consultant that joined our team in December 2015. Claire was formerly a rep in Cyprus and specialises in this destination after living there for years. Her favourite destinations are Disneyland Paris and Canada! Aoife joined the branch straight from school. Her favourite destination being Portugal, where she has spent many family holidays. Louise joined the Oswestry team after working within the company for over 10 years. Louise has also worked direct for a tour operator, and carries a vast amount of knowledge with her. Julie has been in travel for nearly 15 years and has been a manager for 11 of these years. She joined the Oswestry team in July 2016 after returning from maternity leave and wanting to work closer to home. Julie loves to travel and her favourite destinations are South Africa and Thailand. 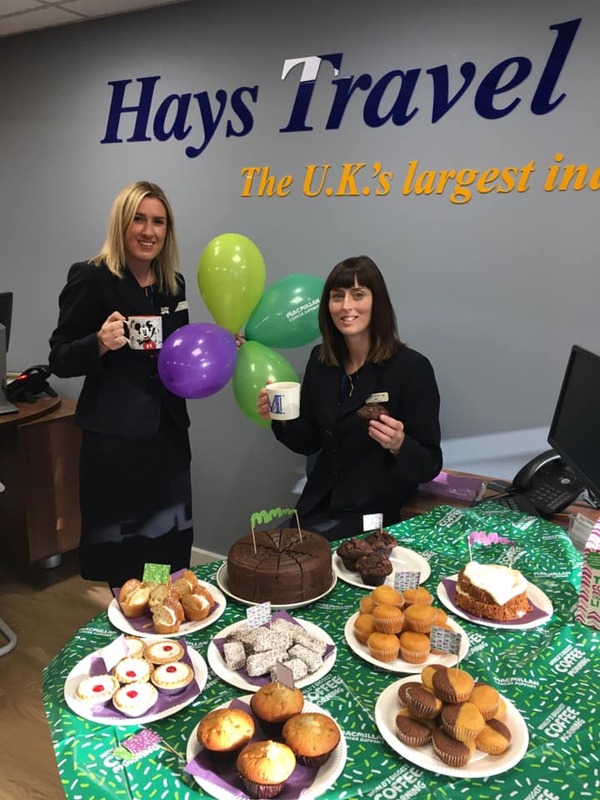 Here at Hays Travel Oswestry, we pride ourselves in providing a high level of customer service and a welcoming atmosphere. We have over 50 years of travel expertise between us and love sharing our knowledge. We love finding all our regular and new customers their dream holiday - whether it's a long haul getaway or a UK break, a cruise or family holiday. We can also provide all the extras that enhance your holiday experience, including travel insurance, car hire, airport hotels and airport parking. Our in-store foreign exchange service offers competitive rates on foreign currency and a buy back service for your leftover holiday money. Our team has been very proactive this year in our attempt to raise money for Cancer Research and Macmillan Nurses. Mel and Sally took part in a sponsored 5k swim, Louise did sober October and we also organised a cake sale in branch, managing to raise £600 this year. We would like to thank everyone for their generous donations. Whatever type of holiday you're looking for; we'll be delighted to help. Come in and see us - we're located on Cross Street in Oswestry, directly opposite Chrissie's Handbag shop. We look forward to seeing you soon!